"The Honda CR-V has earned its place as America's most popular SUV over the past two decades by providing customers with just-the-right balance of features, capabilities, fun-to-drive performance and outstanding quality." said Jeff Conrad, senior vice president of Automobile Sales & general manager of the Honda Division, American Honda Motor Co., Inc., "We are incredibly honored to earn this recognition from the experts at Motor Trend in a very competitive and crowded field." The latest version of the best-selling SUV in the industry features an improved interior with more lavish materials, the most modern infotainment technologies, and plenty of space. It also is among the top contenders in its segment in terms of fuel efficiency, safety features, and aesthetic design, all while representing a good value by packing all of those goodies into a surprisingly affordable package. It absolutely is an award-worthy automobile, which probably is why it keeps on winning all these awards. 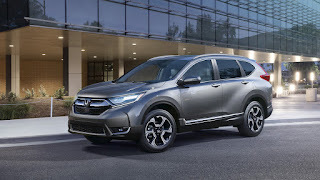 If you would like to get a closer look at the 2018 Honda CR-V, come pay a visit to your friendly Honda dealership in San Diego, CA, and one of our Pacific Honda sales associates will be happy to show you around this lauded crossover.